This gem was brought to me by my lovely wife. It’s fresh. It’s zingy. It sings a little song in your mouth. It’s a great cool meal for those hot summer days. 1. Rinse chicken and place, bones up, in large pot with garlic, salt and pepper. Add water until it’s one or two inches above chicken. 2. Cover pot and bring to a medium simmer for about 60 minutes or until meat easily falls from bone. 3. Remove chicken from pot and allow to cool 20 minutes. 4. Using two forks, remove the meat from the bones and skin and shred it. 5. 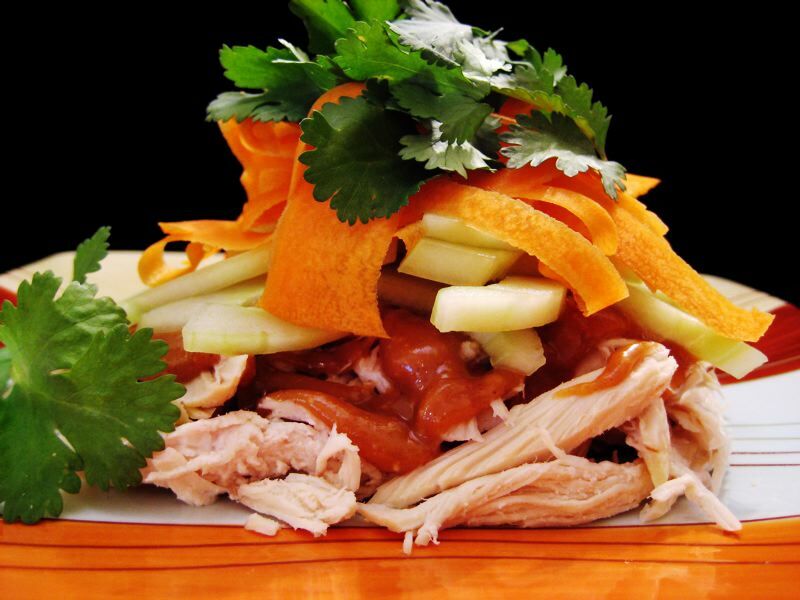 Assemble your plate thusly: shredded chicken topped with peanut sauce, then cucumber and carrot. Lastly a generous capping of fresh cilantro leaves. Click on the image above for an example. 1. Combine all ingredients except for salt. 2. Taste and add salt if necessary. The peanut sauce is great on other things too. Try it on different meats and definitely try it on sauteed baby spinach. How to remove the seeds from a cucumber.